Reading Matt Varnish's recent post on running a Black Power Napoleonics game reminded my how much I missed painting my Napoleonic, actually War of 1812 because I'm a proud Canadian, miniatures. 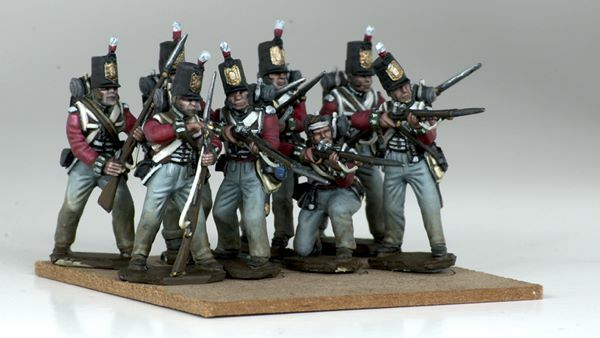 Since I had recently volunteered to write for this blog I was eager for something to talk about and with my mind on Napoleonics I remembered a technique I had used the last time I painted my British Line Infantry. I came up with the technique of using glazes to weather my miniatures because I wanted to show my infantry with dusty pants from a long march but with a planned 300 miniatures in the British forces alone I didn't want to take too much time painting each miniature. Here you can see the finished product with what is meant to look like a light tan dusting. I wanted the dust to fade seamlessly into the rest of the pants and like I said, I wanted it to be quick. Glazing allowed me to apply transparent colour in a controllable fashion to slowly build up the effect I was after. In keeping up a busy schedule and spending the better part of last year working and not much down time, it was tough to get together and chat. 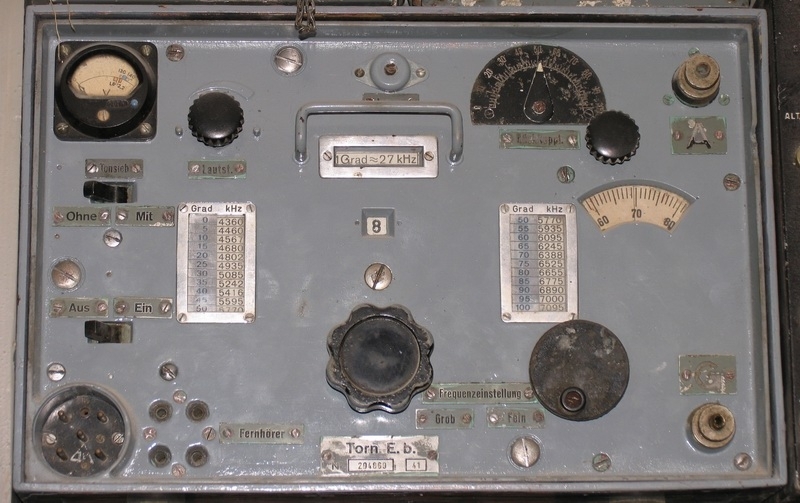 Seems easier to grab the recorder and get some stuff onto 'tape' and posted for all of our loyal listeners without trying hard to schedule something. We appreciate the support and we hope to make this a regualr thing once again. Giving you something to listen to, when you're painting, on the road or relaxing. 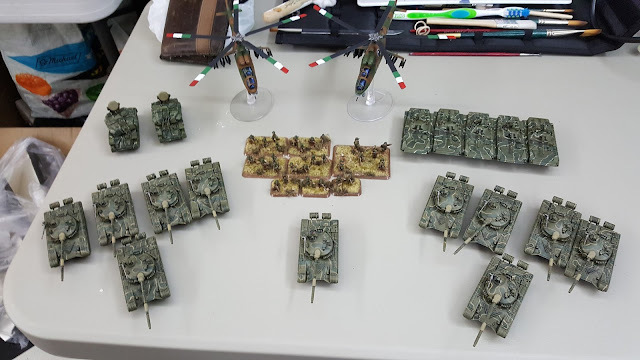 Two new podcasts are posted, the first one is Episode 6 and is one that Dennis and recorded on the way back from a Flames of War tournament in Kingston. This is an older recording that went missing and may be a little louder as far as background. Taping it in my jeep is similar to sitting in a C-130. It's worth it!! 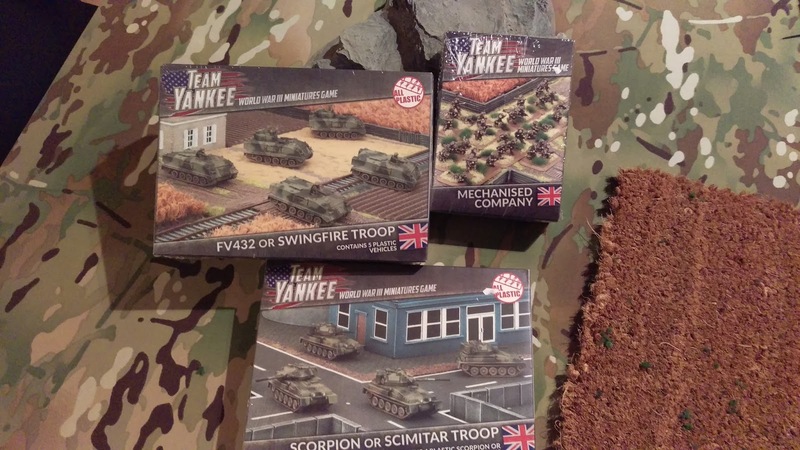 The second episode was done over the holidays, Andrew and myself sit down for a candid conversation about Flames of War, Team Yankee, some version 4 stuff and video game/movie topics. Episode 7, you can use the links or visit us directly on DICE DEVILS PODCAST PAGE to see all the older episodes and their links for your entertainment. Welcome to the new year! Even though we are into another year of gaming, writing and painting, most of us were too busy to get together much over the holidays for any real games. Such is life and some things never change, but it didn't keep Andrew, Scotty (acting as spectator and umpire) and myself from getting a little game of Team Yankee in. Sticking around afterwards, we also have a new podcast recorded and should be posted in the next couple of days!! Very exciting news all 'round. Still need to unbox this lot and start getting it together! I'm excited to add to my army and increase the number of flexible options for my British Army. I listed my points total below at the end of this article. Sorry I didn't include a breakdown of Andrew's forces. We both feel at the moment, somewhere in the 60-75 point range is going to be a lot more likely than 100 points.